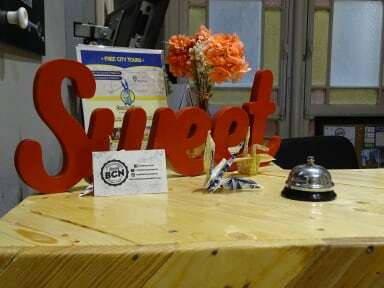 Sweet BCN Youth Hostel i Barcelona, Spanien : Boka nu! Part of the great Sweet BCN Touristic Accommodations family, this Youth Hostel has a total of 5 shared bedrooms and 1 Private Double Bedroom. All of the beds have their own locker space with a key and their own reading light. All bedrooms have AC/heating units. There is a total of 5 bathrooms to be shared among all guests and a fully equipped kitchen. Each guest has its own space in the kitchen to place food. Our dining area is nice and comfortable to enjoy a healthy breakfast before stepping out in the city, or a nice meal after a long day visiting Barcelona. There is also a large living room area for travelers to share experience, information, get ready for their visits, and meet new people from around the world. We are located in the heart of Barcelona's district of Eixample. Known for its modernist architectural buildings such as the very famous, La Pedrera (7 minute walk), Casa Batllo (10 minute walk), and Sagrada Familia (10 minute walk). Barcelona's most luxurious boulevard, Passeig de Gracia, is 5 minute walking from the hostel. Aside from touristic attractions, our chic neighborhood has high quality restaurants and bars, and we are also very close (20 minute walk) from the bohemian area of Gracia. The only smoking area is the balcony. There is a very strict No Drugs policy in the hostel. We like to keep a friendly and respectful environment around the house.